Here at FirstDown PlayBook we take a lot of pride in our football play drawings and we like to think we do it better than anyone else in the world. However, even we understand that a drawing is a drawing and only a part of the formula for success on the football field. If you want to be successful as a football coach, you always have to look at the players on the field to be as good as you possibly can. As we have watched more and more youth football over the past several years, we have noticed that some of the football schemes and trends that we see on television and on the local high school Friday night football fields are making it onto the youth football fields as well. 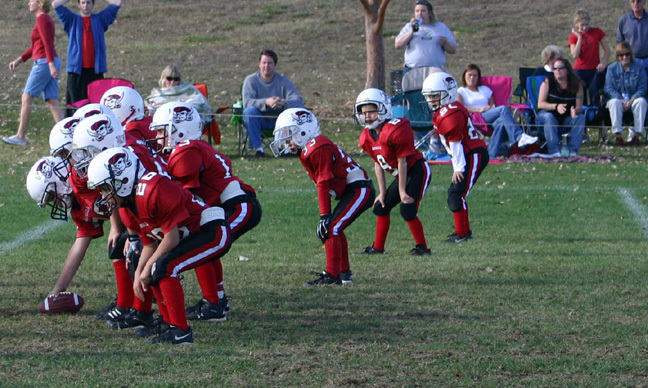 At the top of the list of trends we see starting to infiltrate youth football is the “spread” offense. At first glance this would seem logical. Youth football teams are normally better at running the ball than they are at throwing it. Even in the run game, a lot of youth football offensive schemes involve mis-direction as opposed to brute blocking at the point of attack because the kids are normally not ready for the physicality of power schemes yet. Then, the most obvious reason for running a spread offense becomes evident. After the first one or two practices the coaches look around and see that they have one or two players that are significantly more talented than the rest of the team. The coaches know if they can just get one of these players in space with the ball, good things are going to happen for their offense. So the next thing you know, you have a youth offense that is spread sideline to sideline and a very talented quarterback standing next to a very talented running back with only five or six defenders near the line of scrimmage to defend them. This can be good for the offense but we think bad for the players and the game of football itself. Before we go any further, we just want to offer full disclosure here. We think this is bad for youth football in several ways. When a youth football coach runs a spread offense, they essentially take four or five of his or her players and gets them out of the way so the star player can make something happen with his or her feet. Since often times the defense is playing man coverage at this age level, all of the outside players on offense are just releasing and running their defender off with them. This does not cultivate a lot of learning when it comes to football skills and techniques which should be one of the main reasons there are youth football leagues to begin with. Rarely, will you see a down block or an offensive lineman pulling. There are no lead blocks and, consequentially, there are no defenders shedding this type of block. Often times the quarterback never even learns how to take a snap under the center. Every play is run from the shotgun. Football skills, fundamentals and techniques are not the only things to suffer. When the spread offense is used at the youth level there is a minimal amount of football scheme being taught or learned. It becomes a numbers game and is essentially four corners basketball on grass with the quarterback playing the role of the point guard who is going to take the game over in space. Blocking schemes involving down and around become more rare. Lead schemes are non existent and the defensive schemes are quickly reduced to attempting to get a hand on this one very talented player as opposed to teaching leverage, contain, force and gap control defense. Who is Really Having Fun? Now, before you think that we are delusional enough to assume that there will be many takers on our plea to think of the overall well being of the game before trying to win, we want to explain that we are not that naive. We understand that it is every coach’s job to coach his or her team and let the opponent’s coach do the same. That’s why FirstDown PlayBook is going to switch gears here a little and focus on the youth defensive coaches out there. Defensive coaches, we blame you. Yep, you heard us correctly. It is our opinion that the youth offensive coaches who run spread offenses with nine and ten year olds do it because you allow it to happen. How so? The fact that there are offensive coaches running spread formations must mean that they must have quarterbacks who can wear a defense out on the perimeter with their arm right? No? If not, then why are you lining up in a defense that is defending ghosts? The “ghosts” in this case being the wide receivers. There is a reason why a lot of the successful youth offenses have everyone packed into a phone booth. It’s because they know that there are experienced youth football defensive coaches out there who are going to eventually ignore their wideouts. And when that happens…you guessed it, the offensive coach is forced to bring those wide receivers inside next to the offensive tackles. How Can FirstDown PlayBook Help? We understand that we are up on our high horse here a little bit with this article as we have done a lot of talking about why and what but not much about how. That’s why this week FirstDown PlayBook is going to install a youth football spread beater concept for all five of our youth football defenses. If you are a FirstDown PlayBook member you can be on the lookout for this around mid-week. If you are not a FirstDown PlayBook member, do not fret because we are going to come back next week and get into the “how” to stop a youth football spread offense with more detail. It obviously will not be with as much detail as what we give our members with the coaching points in FirstDown PlayBook, but it will be very helpful nonetheless!